To be able to reflexively use the English vocabulary and grammar that you learn in each lesson, you need to practise the material many times and in different contexts. That is why every lesson includes its own exercise section, and we have included additional exercises in the video lessons too. This is where you put into practice what you have just studied. 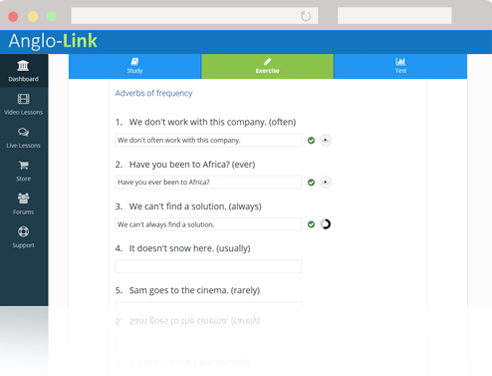 As you type your answer to each written exercise, our software analyses your answer. If you make a mistake while typing, our software warns you and guides you towards the correct answer. Thanks to this great feature, your spelling and punctuation improves at the same time as your knowledge of English grammar and vocabulary. Written exercises to assimilate grammar and vocabulary are essential. However, if they are only in written form and you never hear the correct English pronunciation, you will develop a gap in your listening skills. Also, if you have to imagine the pronunciation of what you are reading, you will inevitably make mistakes that come from the influence of your native language. The key to achieving fluency and confidence to speak English is oral practice. That is why all the pronunciation lessons, conversation lessons, and grammar exercises are professionally voice-recorded so you can hear and repeat everything you study.